Gain MUSCLE and STRENGTH while eating your favourite foods without gaining FAT! I personally spent years trying to figure out the best way to gain size and strength without giving up my favorite foods, and invested thousands in mentors, coaches and courses to improve my knowledge and become a Transformation Specialist. You want a diet that’s enjoyable, one that is easy to follow. You want a diet that doesn't "feel" like a diet but rather just feels like a change in food choices that you can enjoy while building muscle and getting stronger. 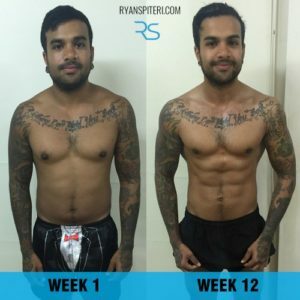 Before, I show you how you can achieve muscular body you’ve always wanted, I want to demonstrate what’s possible if you follow a well put together plan. This is me… First pic is when I was about 3 months into training, the second picture is after years of lean bulking. I followed the same nutrition and workout principles I am about to reveal to you!